Green square blog featuring current issues and information on renewable energy and its efficiency, reliability and how to make the swap to renewable energy. Information on products biomass boilers, biomass stoves, air source heat pumps, ground source heat pumps, solar PV, solar thermal. Move over dirty old wood fire, the future is here. It's time for pellets to shine. The quintessential English wood stove has been given a very large shove into the 21st century with the introduction of indulgent Italian designed pellet fires. This season’s ‘on trend’ gadget are the highly impressive pellet stoves or fireplaces from Italian company MCZ supplied through local company Green Square, with branches across southern England. Visit our Energy Showrooms page to find your local store. Forget dirty old wood stoves that need filling every half an hour and cleaning every day just to get that real wood glow and warm feeling you can only get from a stove. Pellet stoves are here and the benefits over the traditional stoves are extensive. Wood pellet fires or stoves use real wood pellets derived only from sustainable sources to ensure you get a real wood fire flame. Pellets are loaded into the stove through the top into a chamber big enough to keep the fire burning for around 20 hours. Ignition is automatic, so no need to get the newspaper and matches out, in fact the stove can be con-trolled from your arm chair via the supplied remote control or via a smartphone app. 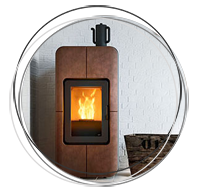 'Italian designed, state of the art pellets stoves with all the charm of wood with the ultimate convenience of pellets. Smart phone app or remote controlled with auto ignition and programming'. Furthermore the stove can be programmed to turn on and off automatically in the same way as your gas boiler at home. Cleaning is simple and only needed when the ash tray is getting full, often this can take weeks. The green credentials are also impressive, being over 90% efficient they are around twice as efficient as a wood stove. Pellets are delivered in bags to avoid dust and ease of storage and are available via delivery to your front door. Installation is quick and easy, with installation into existing fireplaces or into other areas with-out a chimney such as kitchens, open plan rooms and conservatories. These stunning designer ‘award winning’ stoves are the future of fireplaces in England, why not be amongst the first to move into the 21st century and keep one step ahead. Order now for pre-Christmas installations.